The owner of Sappi Fine Paper North America in Westbrook is now considering removing its Saccarappa Dam. 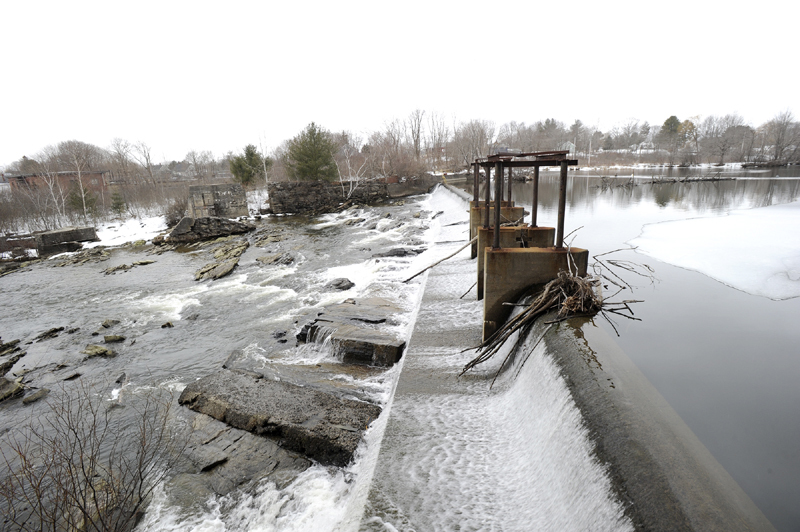 The owner of a paper mill in Westbrook that fought for years against state and federal requirements to build fish passages at its dams on the Presumpscot River is now considering removing its Saccarappa Dam. Sappi Fine Paper North America and the city of Westbrook announced Wednesday that they’re working together toward removing the dam to allow natural fish passage and greater recreational use of the river. The city and Sappi said they hope to get support from environmental groups and regulatory agencies to move forward with the removal of the dam, where Sappi is required to build a fishway by 2015. The company treated dam removal as a nonstarter in its years-long court battle with conservation groups over fish passage, said Michael Shaughnessy, president of the Friends of the Presumpscot River. The paper company wouldn’t say Wednesday why it has had a change of heart. City officials said the dam’s removal would create whitewater recreational opportunities and improve the fishery where the river flows through the city. The fight over fish passage at Sappi’s dams began in the mid-1990s, when the company applied to the Federal Energy Regulatory Commission to renew the licenses of its five hydroelectric dams on the Presumpscot. After conservation groups intervened, FERC granted licenses that required Sappi to install fishways at the dams — a condition that the paper company appealed to the U.S. Supreme Court and lost in 2006. Fishways include side channels, or ladders, that allow fish to swim around a dam, and elevators that mechanically lift fish over a dam. Sappi didn’t have to build the passages right away because a fish passage first had to be installed at the lowest dam on the river, the Cumberland Mills Dam. That dam, which Sappi uses to draw water for cooling, is regulated by the state, not FERC. It would remain on the river under the plan announced Wednesday. The Maine Department of Inland Fisheries & Wildlife ruled in 2009 that Sappi would have to build a fishway at the Cumberland Mills Dam. A fish ladder is being built there now and must be operating by May. Sappi will then be required to build a fishway at Saccarappa Falls, the next dam upriver, within two years. And it eventually will have to build fishways at its four dams upriver from Saccarappa Falls. The timing of those projects depends on how quickly fish such as shad and alewives repopulate the river. Sappi spokeswoman Joanna Rieke refused to say Wednesday whether the removal of the Saccarappa Dam appeared to be a quicker or less expensive option than building a fish ladder. Rieke also would not say whether the company is considering removing any of its other dams, rather than building fishways. Assistant City Administrator William Baker said Westbrook has applied for a $733,000 grant from the National Oceanic and Atmospheric Administration to study the environmental impact of removing the dam. Opening up the falls would make the river more attractive to kayakers and be a key part of the city’s larger effort to rejuvenate the riverfront, officials said. The city plans to install ramps and docks along the river this spring to create easier access for people with boats and on paddleboards. The dam’s removal would create a free-flowing stretch of river for more than three miles from Windham through downtown Westbrook. Baker said Sappi is also considering donating 8 acres along the river and the island in the middle of the falls. “The Presumpscot River runs through the heart of our community and we think it is the key to our environmental and economic revitalization,” said Mayor Colleen Hilton in a prepared statement. When asked why Sappi is suddenly interested in removing the dam, Rieke stressed the community benefit and said losing the energy source would not significantly affect the operation of the mill. At least one conservationist was dubious about the announcement. “I have to imagine that Sappi’s interest here is not the benefit of the river or Westbrook, but the bottom line,” said Mahoney, with the Conservation Law Foundation. Mahoney cited an announcement Sappi made in 2007 that it was going to remove the Cumberland Mills Dam — a plan it pulled out of a year later, without explanation. Shaughnessy, with the Friends of the Presumpscot River, said he will watch closely to see that Sappi meets its requirements to allow fish to pass by the spring of 2015, but he was less skeptical of the company’s motivation. “It is really nice to see Sappi coming around like this,” he said.